What seemed fun and adventurous to me as a kid, now seems grotesque and macabre as an adult. I have a particularly vivid memory of playing one day in my grandfather’s slaughterhouse. I remember pulling on my shiney new wellingtons and walking down the laneway full of anticipation. My older cousins, somewhat annoyed that they’d been charged with minding me for the day, worked through their resentment by describing what lay ahead in excruciating detail. I can still feel the thrill of belonging as I went through the childish ritual of crossing my heart and hoping to die rather than tell any adult of our adventure. The slaughterhouse was strictly off-limits. I have clear memories of swishing through the ankle-deep rivers of red that swirled underneath the freshly hung carcasses of pigs and sheep and cows. I can still feel the texture of the marble-like fat on the meat and smell the iron from the pools of blood. I was small enough to hide myself in a carcass during a game of hide-and-seek. I can still recall a game of football, played with a cow’s bladder, inflated with a bicycle pump, knotted, and left to harden. This, of course, was back in the days when the simple pleasures in life were just that: simple. I have a hard time reconciling those carefree days when blood was no more than a byproduct of normalcy with my 21st century reality. Somewhere in the intervening years, I developed a strong dislike of the stuff. For a long time I resisted all pleas to donate blood, figuring that plenty of others were already doing it and that the world would get along just fine without my little contribution. Most of my friends in Ireland give blood on a regular basis. I used to think it was because of the free glass of Guinness given to all donors during the ‘recovery’ period – a practice that has sadly been discontinued; the more sedate cup of tea is a poor subsitute. It was at college that I first gave into peer pressure. I was 17. The blood bank refused my blood, telling me that I was anaemic. I used this as an excuse not to give blood for the next 17 years. Coward that I am, I just couldn’t get my head around needles, tubes, and pints of blood leaving my body. My next attempt was in the UK where, again, bowing to peer pressure , thickened with the added guilt of collective responsibility, I signed up for a blood drive organised by the company I was working for. But they didn’t want my blood either; this time because I’d just come back from India and it might somehow be tainted. I’d psyched myself up for this and wasn’t at all happy to be rejected. So, when my quarantine was up, I tried again and for the remainder of my time in the UK, I gave blood regularly. It’s in me to give. Back in 1901, Karl Landsteiner, an Austrian physician, discovered the first three human blood types: A, B, and O. As the most important figure in transfusion medicine, he was duly awarded the Nobel Prize for Medicine in 1930. Two years later, in 1932, the first blood centre opened in the Soviet Union. This rapidly spread and by the mid-1930s, the Soviet Union was home to more than 560 blood centres, large and small, where canned blood was stored and dispatched around the country as needed. 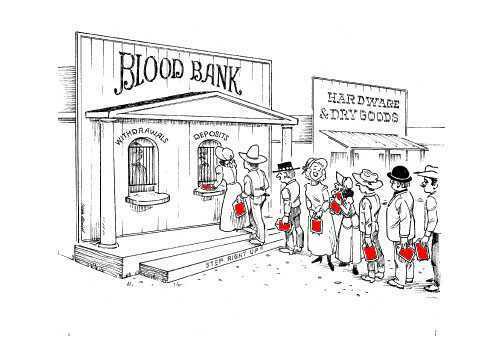 News of this remarkable system reached the United States and in 1937, Budapest-born Bernard Fantus, Director of Therapeutics at Cook County Hospital in Chicago, first coined the term ‘blood bank’ to reflect the centre he had set up to preserve and store donor blood. We’ve come a long way since bloodletting and leeches; since Pope Innocent VIII had an apoplectic stroke in 1492 and underwent a blood transfusion. Today, to meet the needs of the 10 million or so people living in Hungary, approximately 450,000 blood donations take place each year. This means that, on average, each person donates 1.6 times. I know I haven’t given blood since I’ve been here (shame on me), so someone else must be giving it for me. I have fallen in love. Truly, madly, deeply. I know I do so at a somewhat alarming rate, but this time it’s for keeps. I simply can’t imagine any circumstances under which I would fall out of love with this man. And no. This isn’t the lustful blush of a fatal attraction but rather the result of an earth-shattering, mountain-moving, tsunami-like surge of emotion that has lodged itself firmly in my bones, having already run roughshod over my heart. Havasi Balázs defies all conventional wisdom as to what an internationally renowned concert pianist should look like. Not for him the gloved hands and associated delicacy. Although clad in black from head to toe, his ensemble – shiney patent boots, black jeans, fitted black shirt, black suit jacket – was a far cry from the tuxedo’d look favoured by many in his position. Foregoing the combed-back or side-parted hairstyle also favoured by his ilk, his shock of blond hair screamed rad! Taking the stage for the final session of the TEDx Danubia in the Urania theatre in Budapest, Havasi’s mandate was to share with us something of his search to find a new musical lanuguage to communicate, ‘not to copy, not to imitate, not to replay the concepts of others. Rather to create a new style in which his classically trained style is mixed with the musical inspiration of the modern world around him’. He was coming on after the legendary John Foppe, who had had the first standing ovation of the day; a hard act to follow. But follow it he did, and in what style! According to Havasi, with the advent of social media, composing music is a little like writing a message, putting it in a bottle, and then casting it into the ocean for somene else to fish out and add their creativity to it. The compostion is the music. The ocean is the Internet. One tune he composed in his attic room in Hungary – Tüdérálom – has found him aclaim all over the world in the package of Tracey Thorn’s You are a lover. In 2009, he set a new world record for the fastest pianist, 498 repetitions in 60 seconds. And when you see him in action, beating the music with his left foot, rising and falling on his seat, leaning in to the keyboard, you see how this is possible. He plays with every inch of his body and soul – not just with his hands, heart, and mind. He told us of how uncool it was to be a pianist growing up, how he took pains to hide it from his friends, afraid that playing the piano would exclude him from playing ball or hanging out. But that when they came to see him play (he was playing classical music back then) they all converted. Who said Bach could not be fun? This classically trained graduate of the Hungarian Academy of Music always wanted to be a rock star. And he sees no reason why his classical training should stop him. So when he launched into his latest piece, it was loud, loud, loud. The sound filled the Urania and I had little trouble imagining him playing Wembley or O2. Not far into his piece, we could hear the drums but not see them. Then on stage wheeled Andy – the drummer from the Hungarian band, Hooligans, who made the news a while back for being accused of causing ‘moral damage’ to the citizens of Moráhalom. With tatoos for sleeves, he too was in black, punctuated by chains, studs, and piercings. That the pair have played together before was obvious; that they share a mutual respect was tangible, that this unlikely duo from two completely different musical backgrounds could together produce such an amazing sound, was inspiring on so many levels. I have no doubt in my mind that Havasi will accomplish his goal of ‘reinterpreting the possibilities and dusting off the concept of piano concerts that has solidified over the course of centuries’. In front of 400+ in the Urania on Friday, 25th March, 2011, he made a start. For me, the performance last night ranks right up there with seeing BB King play in a boxing ring in Dublin so many years ago and seeing Leonard Cohen on his comeback tour in an outdoor gig in Amsterdam. I am kicking myself that I didn’t know of him in time to catch his concert here earlier this month, the Symphonic Red. Symphonic conveys a musical world that cannot be categorized into any of the traditional musical genres. It contains elements from New Age, World Music, classical and pop music, as universal contents cannot be squeezed into the limitations of a single genre. Bertie Downs, the manager of REM heralded the birth of a new musical category in relation to this project, which he labeled World Classical Music. It is a new, multicultural genre that will touch the souls of people all around the world. Deliver me from inanity, from the idiotic, senseless, banal conversations that people engage in these days. A born eavesdropper (I prefer the term ‘naturally curious’ to ‘nosey’), I am suffering for my art. And it is an art. To sit and listen in to someone else’s conversation all the while appearing as though I don’t understand a word takes a certain skill. To compose my features so that nothing registers, no matter what I overhear, takes talent. The effort it takes to harness that natural reflex to interject with an opinion has released many a holy soul from purgatory. Yes, I am suffering; suffering to the point of resigning my membership of the International Eavesdropping Fraternity. I’m on the brink of handing back my membership card and cancelling my annual dues. Why? Because there is simply nothing worth listening to any more. While sitting at Ferihegy Airport having a coffee, waiting to board a flight to Kiev recently, this British couple stood up from the table beside me. ‘I’m going to stretch my legs’, she says. Much more interesting are the foreign-language conversations that I earwig on. To get any sense of meaning from those, I have to position myself so that I can glance surreptitiously at the speakers. After all, apparently only 7% of our communication is done through words – the other 93% is tone, inflection, body language, all those word-free ways in which we get our message across. So, strictly speaking, it’s not necessary to understand the language in order to understand the message. The Italians are best – arms waving madly at what could be anything from a description of a terrible tragedy to an account of a recent shopping trip to Milan. Next in line, for my money, are the Russians where tone and inflection are often so incongruent with the message that couples might equally be declaring undying love and affection as threatening to leave and take the fur coats with them. One of the consummate joys of eavesdropping on a foreign-language conversation is that I can make it up as I go along. And if it’s Hungarian, so much the better. I get to fill in the blanks between the few words I recognise and take it from there. My eavesdropping world is an anthology of short stories just waiting to be written. In my ideal word, people would only speak when they had something to say, something of meaning, something that other people needed or wanted to hear. 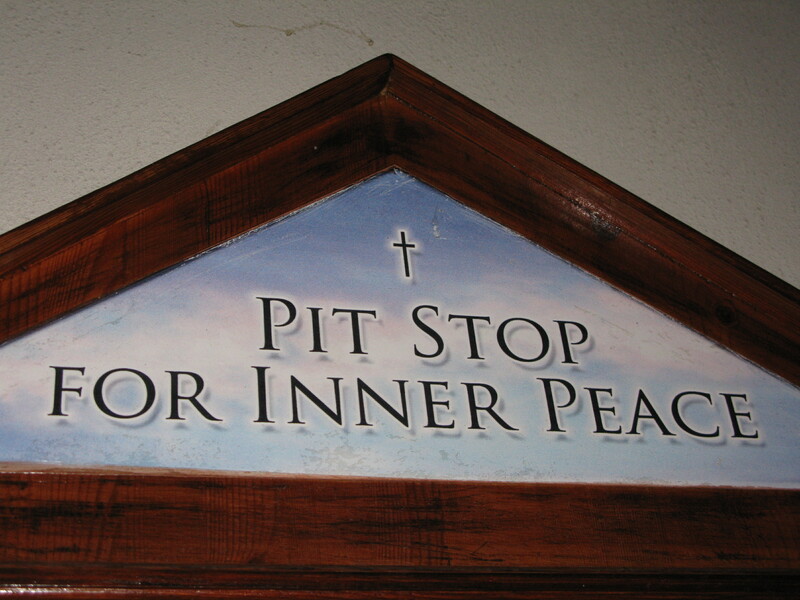 Imagine the quiet, the calm, the peace. Imagine, too, how we would really listen to each other instead of tuning out, how we would value each other’s interventions, and how conversation would take on new meaning. Just imagine! 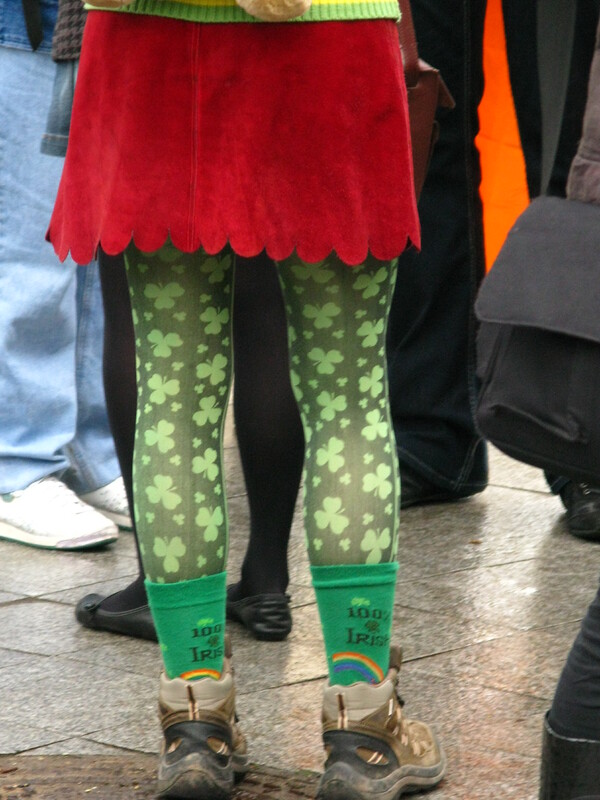 I dislike St Patrick’s Day parades with a passion that should have received specialist treatment long ago. 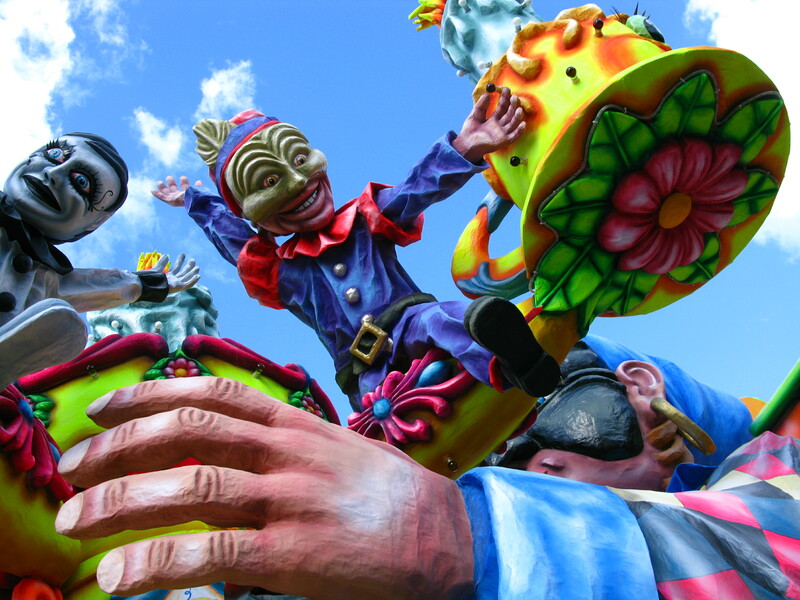 It’s not just St Patrick’s Day parades, it’s any parade. I’m a self-confessed parade pooper. 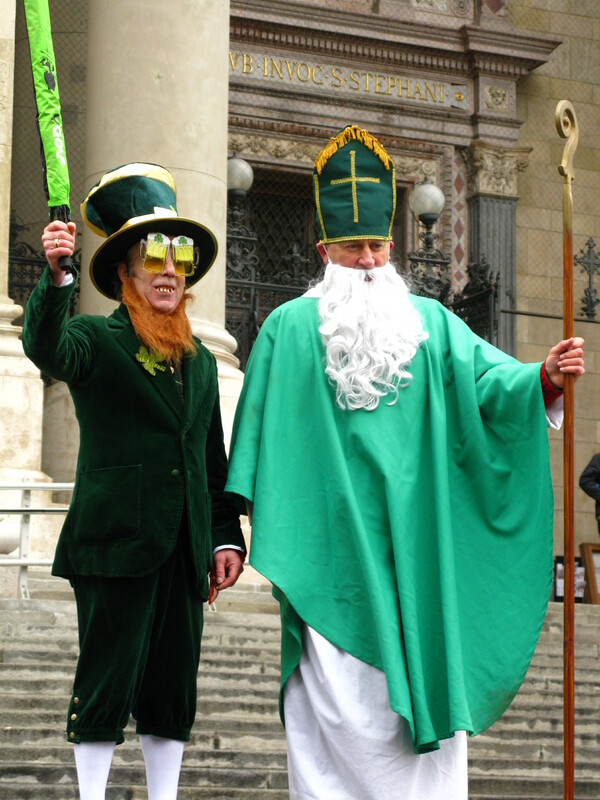 So, sometime late last summer, when I first heard about the idea of staging a St Paddy’s Day parade in Budapest, I cringed. I heard it twice from two people I both like and admire so for once, I kept my mouth shut; I held my counsel. For the past few months I’ve been silent on the subject, keeping my distance. Other than haranguing the organisers about missing apostrophes and unnecessary full-stops, I have said nothing, and done even less. I even went so far to arrange to be out of the country for St Patrick’s Day itself, but I was out-paddied. 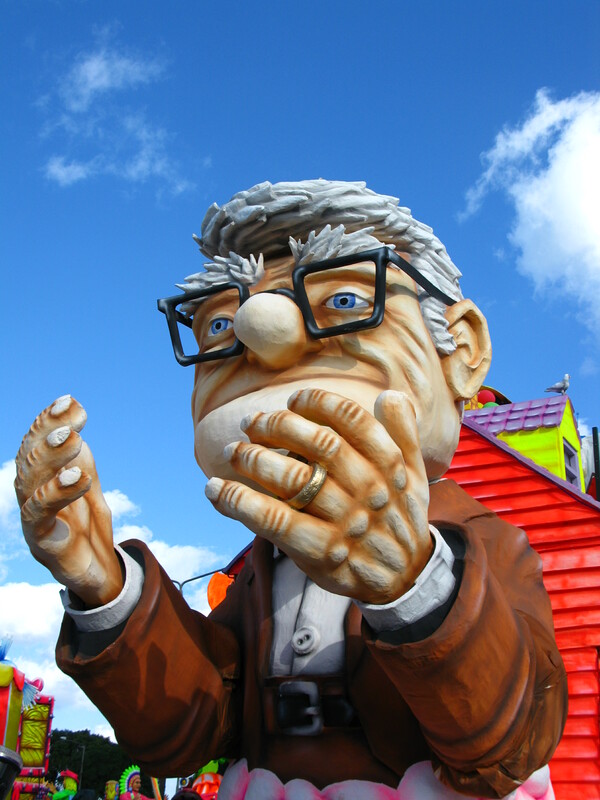 The parade was scheduled for the 19th and I arrived back in town a day too soon. Today, Saturday, was a miserable day – damp, drizzly, and grey – typical parade weather. Tempting as it was to stay home and clean my floors and windows, sort my socks and alphabetise my spices, I couldn’t not go. I’m Irish for God’s sake. I had to go. I had no excuse, at least none that would hold water. 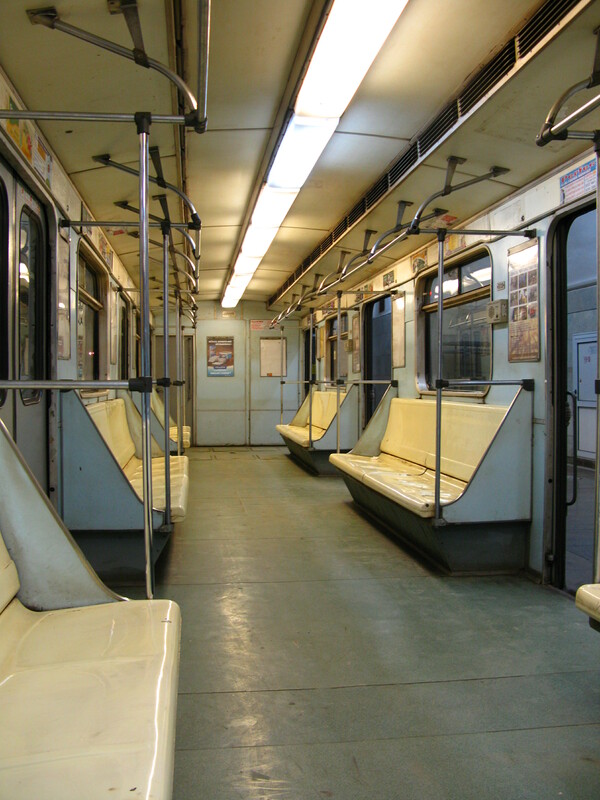 So off I toddled to Szabadság tér for the grand gathering, with every intention of showing my face, saying my quick hellos, faster goodbyes, and then beating a hasty retreat. When I got there, I saw a sea of green in the top corner of the square. The weather was doing little to dampen the enthusiasm of those who were first to arrive. Had Johnny Cash risen from the dead and launched into 40 shades of green, it wouldn’t have surprised me. I doubt the wearin’ of the green has ever been taken so seriously. The IHBC lads were togged out in style with St Patrick and the Leprechaun playing their parts a little too convincingly. From toddlers in prams and pushchairs to those who have seen more than a few parades in their lifetimes, the crowd slowly grew. 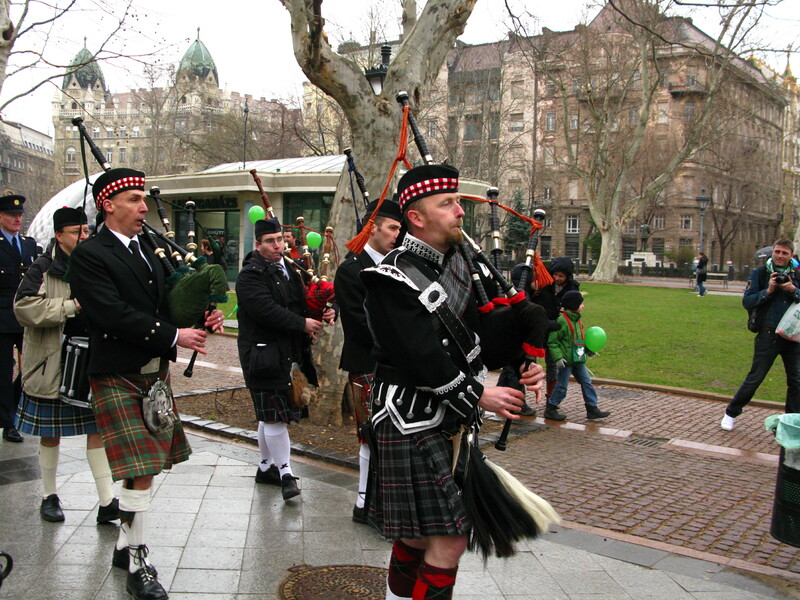 When the pipers arrived and opened with Amazing Grace, something inside me switched on. I finally got what it was the lads were on about, the gap they wanted to fill and suddenly a St Patrick’s Day parade didn’t seem like such a bad idea after all. 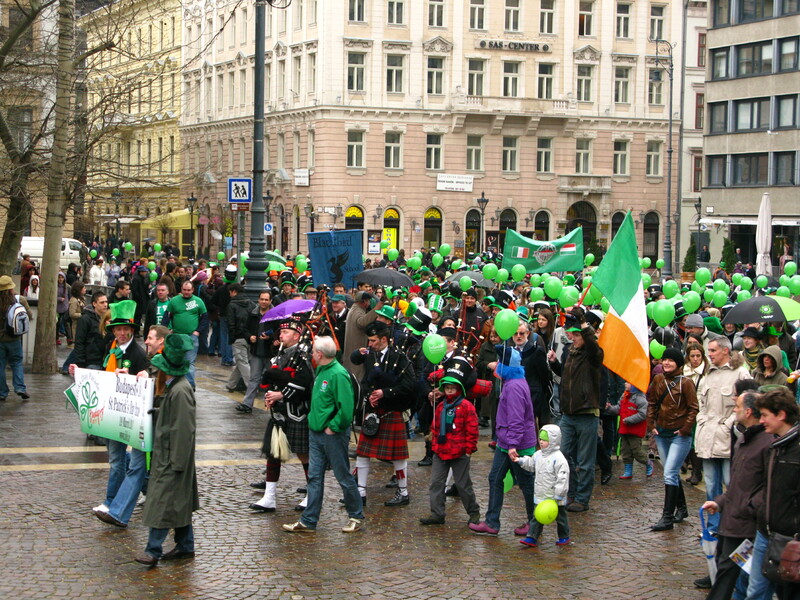 It’s not often that the Irish in Budapest get to gather in one place for one reason and it quite surprised me to see so many there. And I know they weren’t all Irish Irish – which is even better still. James Michener, in his 1957 book, The Bridge at Andau, describes the Hungarians as the Irish of Eastern Europe. 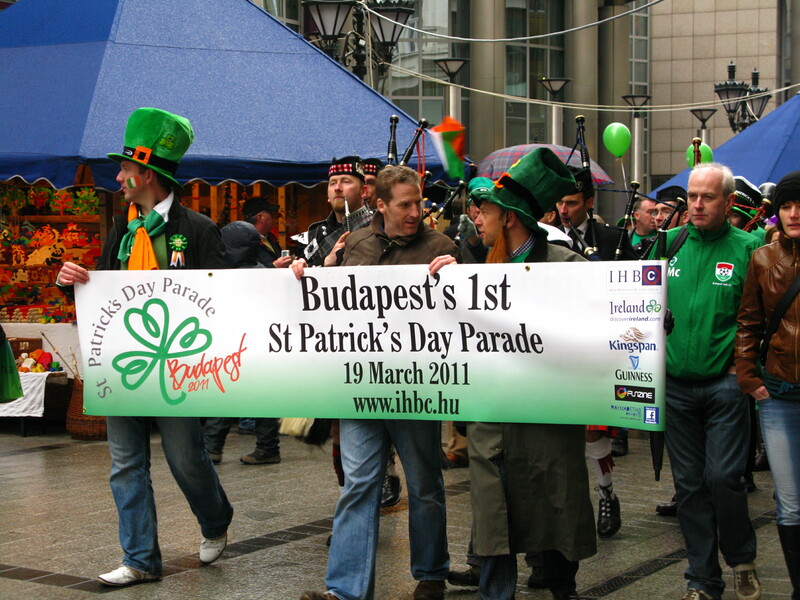 There is a huge affinity here for all things Irish – and while that can be said of many places, to see such a friendly, fun, high-spirited parade in Budapest that served little other purpose than to underscore the importance of having the craic, was probably an attraction in itself. Today was a work day in Hungary but that didn’t stop those in their offices along the route stopping for a minute to wave and wonder. The bemused faces on the passersby, or the faces of drivers stopped in traffic to let the parade were priceless. For many, seeing St Patrick standing on the steps of the Basilica with a Leprechaun by his side, both dispensing blessings on the crowd below, must have seemed a little surreal. 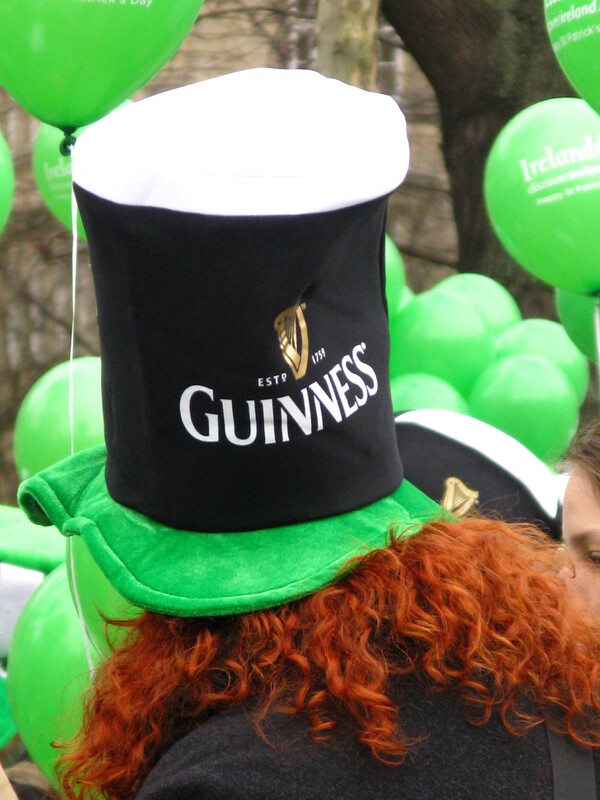 As the sea of green marched onwards towards its final resting place – the Guinness House – more and more people joined in. I stopped once to count and at a rough estimate I’d say 546 people took part, give or take a couple of balloons. Not a bad showing at all for a first attempt at rallying the troops. If you’d told me a few months ago, or even last week, that I’d have marched in a Paddy’s Day parade of my own volition, I’d have said you were mad. If you’d told me that not alone would I have marched, but that I’d have enjoyed it, I’d have said you were off your rocker. But sometimes it’s not a bad idea to remind myself from whence I’ve come and to take a little pride in the fact that St Patrick’s Day is billed, worldwide, as the friendliest day of the year. 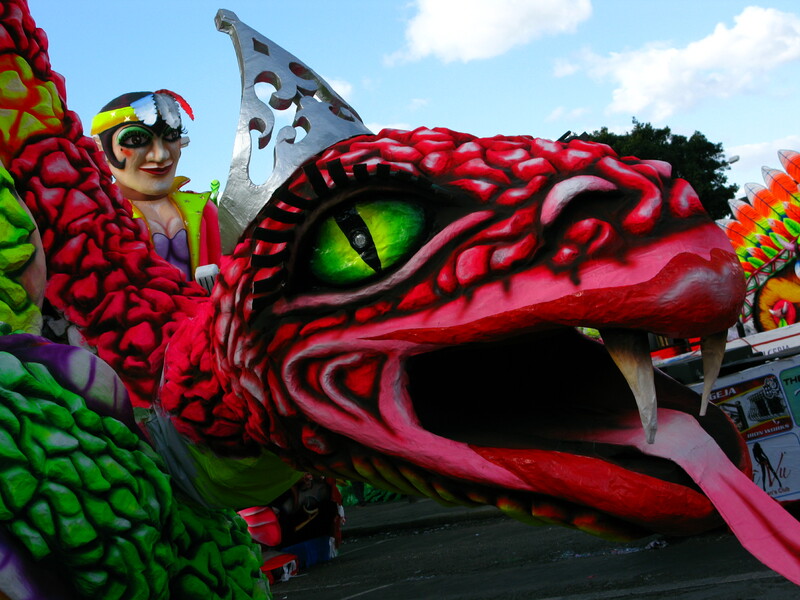 So kudos to Messrs Downey and Griffin and Harron, the IHBC, and parade volunteers for pulling this one off. Impressive stuff. 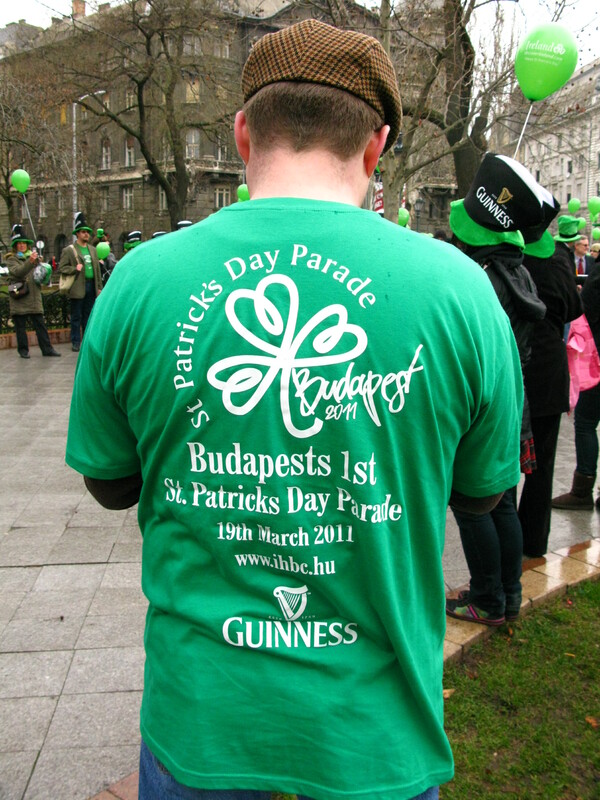 Today was a good day to be Irish in Budapest. And, you never know, next year I might even wear a hat! You wouldn’t believe me if I told you that it’s taken me this long to recover from my first Ír KocsmaSó (an odd assemblage of words that translates literally into Irish pub salt but really means Irish pub show – punning in a second language is oddity only outdone by the little bags of salt we were given as gifts on the night). And a most peculiar night it was, too. Mistake No. 1 was to think that my Hungarian was good enough to get the gist of what was in store from the website. Yes, I realised it was in the sticks – the suburbs of Budaörs at the Jókai Mór Müvelődési Központ, affectionately known as JMMK. But I didn’t realise that it isn’t a pub… it’s a cultural centre. Yes, I realised that it was being headlined by Firkin, an Irish rock band, but I didn’t realise they weren’t Irish. And yes, I realised that Jamie Winchester was opening for them, but I didn’t realise he would be joining in their first set, not playing on his own. I had read something about Irish stew and free guinness (neither of which particularly excited me) but somewhere deep in my subconsciousness I was missing Ireland terribly and wanted a taste of home, no matter if that taste amounted to two things I least like about Ireland – pottage and porter. So I convinced a couple of Hungarian friends who have been talking about going on holiday to Ireland that they should come along for the experience. In my head I imagined a smoke-filled room crammed with people sitting chatting and others milling around and more still propping up the bar. I imagined Whelan’s on Wexford St, perhaps, or some such venue in Dublin. I thought the crowd would be youngish and mainly Irish or at least British (given that they’re an Irish Irish band, mar dhea). And I was really looking forward to having the craic. When we got there, there was a queue forming outside. When we went in (and we were lucky to get tickets and lucky that HÉ and TZs insisted on coming early) there were more queues inside – for the stew and the guinness and for the bar. The doors to the auditorium were shut. People were perched on windowsills lining what looked remarkably like a school corridor. The crowd was a little long in the tooth and instead of being in Whelan’s, in my mind’s eye I was back in the Galtee Mór in Cricklewood, North London. Where were all the fit fellahs? Somewhere during the tombola, the shapeshifters moved in and the crowd took on a new form. Then the lads took the stage – or more correct, six lads and a female fiddler. The prose-like delivery of the first verse of Whiskey in the Jar in a rather affected British accent had me a little worried but then the rockin’ kicked in and the gig took off. It seemed like everyone of them were doing their own thing and yet it all came together. There was nothing choreographed about it. The crowd went mad. I went mad. You wouldn’t have recognised me! I was mesmirized by the flautist (Janós Péter), leaping around the stage like a court jester without the hat, wearing a mic that looked a remarkably like a third eyebrow. The lead singer ( Marthy Barna) looked a lot like Colin Farrell without the chin. He’s a fine cut of a lad who does justice to the old Clark-Gable-vest-and-open-shirt look. It was only a matter of time before that shirt would come off and those biceps would get the airing they so richly deserved. The collective intake of breath from the female audience was nicely balanced by Göttinger Pali on acoustic guitar and lead vocals. Pali looked like he’d stepped off the back porch of a Grizzly Adams set. With the flat cap and check shirt, I had a hard time believing he wasn’t Irish. Pitch perfect in his enunciation, he was a joy to listen to. All of which I know I told him afterwards, repeatedly. Am blushing to think I was so brazen. Can you just imagine me as a punk Irish groupie! Somewhere in the middle of Colin Farrell and Grizzly Adams is Marczis Attila (on electric guitar) who sported a short back and sides that made me wonder what he’d look like in uniform. Szuna Péter (Bass) and Juhasz Robert (drums) made up the complement along with the dextrous Virag Lili on the fiddle. One of her first times out with the lads, she really made that fiddle talk. Hearing with Wild Rover sung with a Hungarian accent was fantastic. And where have I been all these years that I never heard bitchin’ in the kitchen before? The night was only beginning when they finished with yet another go at Whiskey in the Jar – this time in Hungarian! It was quite surreal in a way, a bit of a time warp. Suddenly I was 21 again, and back home in Dublin. I only wish I’d woken up from this particular delusion in time. 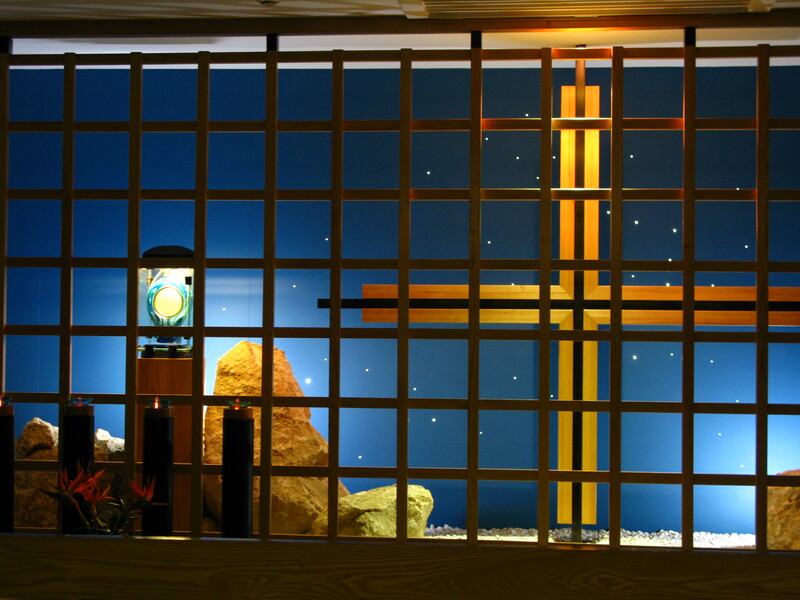 Despite the wonderful company of hedgehogs, griffens, and ministering angels, there’s simply no getting away from the fact that I just can’t hack the long nights and small hours any more. Give me another few weeks to fully recover though and I’ll be in the front row of Firkin’s next-but-one BP gig …Gödör Klub 23 April. 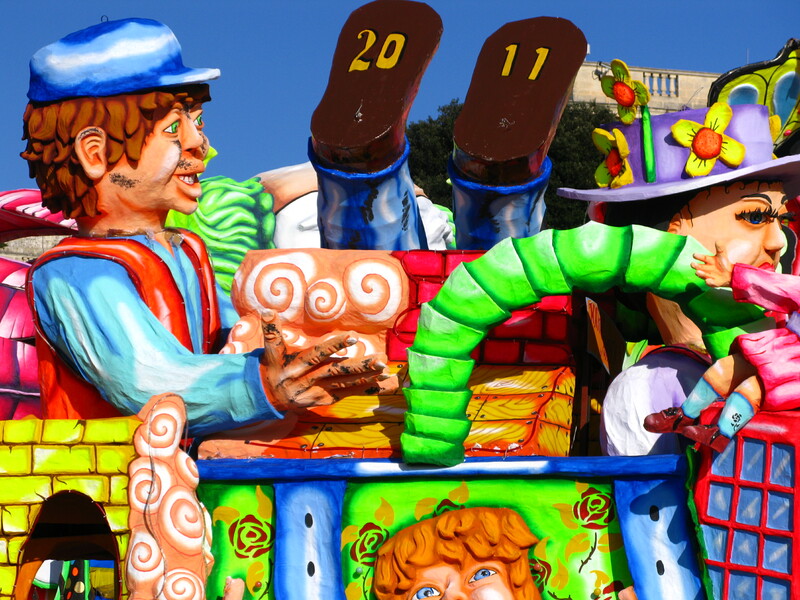 day of a three-day festival on the main island and THE day of a rather alternative five-day festival on the island of Gozo. are out in full force and available everywhere. Back in the day, these would be tossed from the floats to the crowds. I missed that this year but that’s not to say it didn’t happen! Those who want to go for broke can gorge themselves on prinjolata – a heap of sponge, biscuits, almonds, fruit topped with cream and pine nuts. adjectives from grotesque to unusual, from macabre to peculiar. 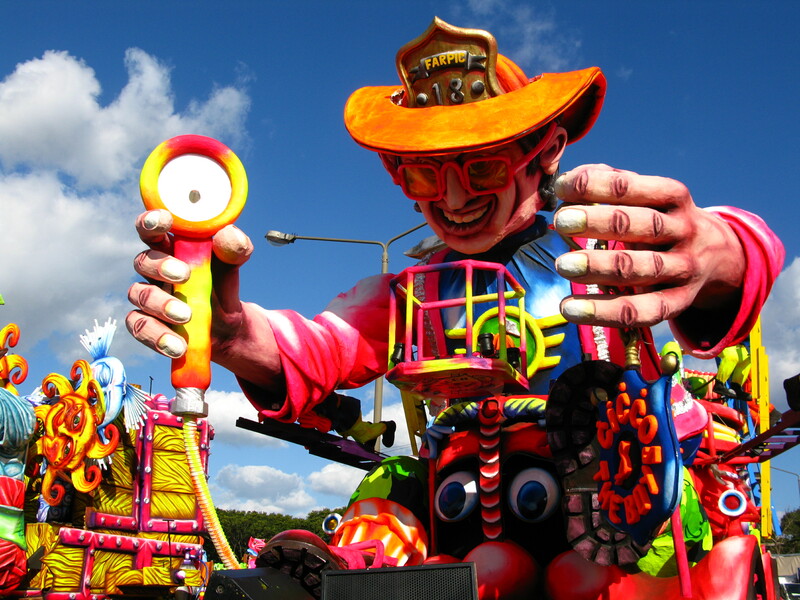 While parts of the five-day celebrations are organised, it’s the Spontaneous Carnival that attracts thousands by its weirdness. It’s not officially organised by anyone apparently, but at sunset, the masses take to the streets, dressed up anywhich way, masks hiding true identities as they everything they can to get the crowds going. 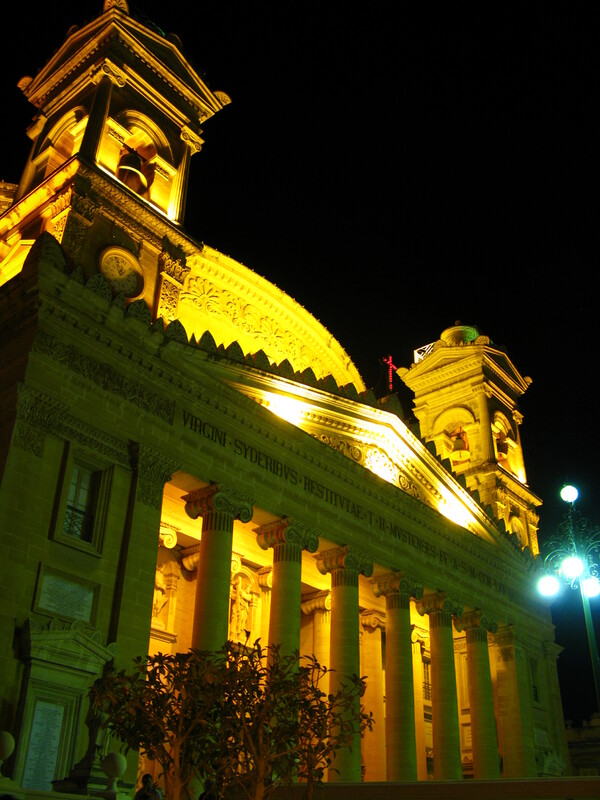 This one sounds just odd enough to be worth a visit and is on my list of things to do in Malta next year! When I said I was going to Modica, they asked me why. When I said I’d found a nice hotel, they looked askance. Surely I could find a nice hotel in a city that was worth seeing. No-one goes to Modica. 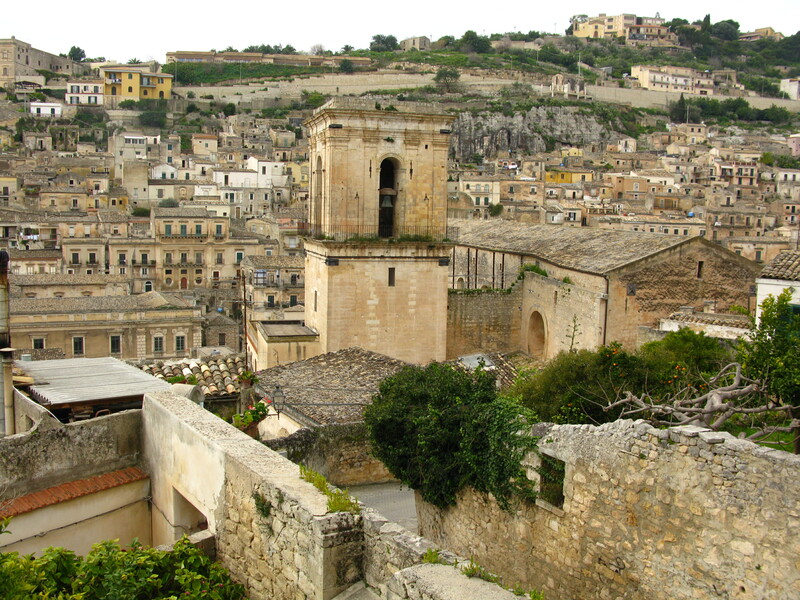 It’s one of those cities you pass by on the way to somewhere else – to Catania, or to Siracusa, or even to Ragusa. But no-one goes to Modica. Well, in February, they’re probably right. I’m sure we were the only tourists in town. It felt as if we had the place to ourselves and it was lovely. We briefly thought about venturing further afield but both agreed that there was more to the city than people had led us to believe. 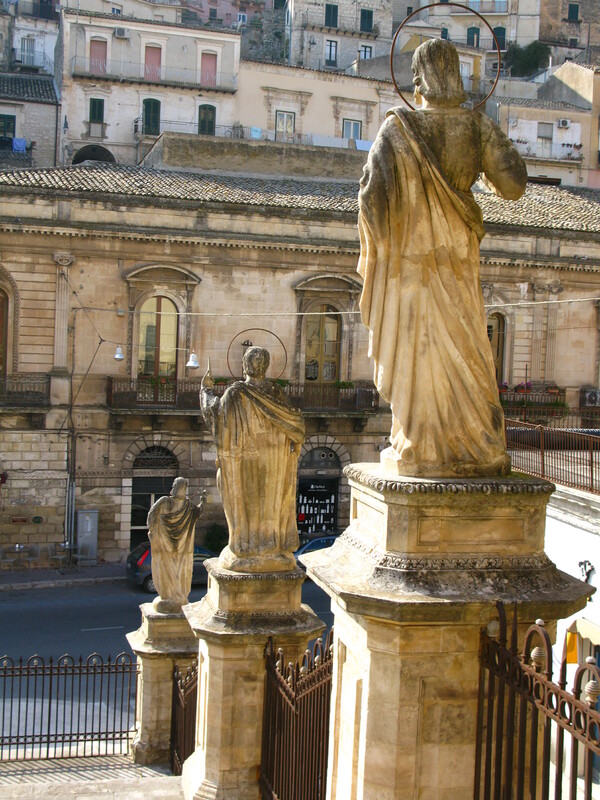 About 20km from the port of Pozzallo, the city of Modica dates back to around 1300 BC and is known mainly for its baroque architecture. It’s home to about 60,000 very stylish, if slightly extreme Sicilians. They’re either very friendly or very dour – no half measures. The city is known for its one hundred churches (and while there are lots of them, 100 might be a bit of a stretch, unless you venture out into the hinterland and count the ruins). It’s also the birthplace of Salvatore Quasimodo, who won the Nobel Prize for Literature in 1959 and of the 18th century philosopher Tommaso Campailla. Seeing the typewriter that Quasimodo used and the room in which he worked was inspiring. The view from his balcony would do wonders for me, too. Mind you, I was far more impressed when I discovered that it was one of the locations for the Inspector Montalbano series – a delighful set of novels by Andrea Camilleri featuring the irrepressible Salvo Montalbano, a man who loves his food. Three days wasn’t enough to see the insides of all the churches or indeed to sample the wares of all the chocolate shops. It would seem that Modicans are religious about their chocolate. (Apparently it’s made from an ancient Aztec recipe.) Even the pizzas come with chocolate! And the hot chocolate isn’t your usual chocolate flavoured milk – it’s a full mug of melted chocolate. So add some Italian shoe shops into the mix and you have a city break from heaven. But things weren’t always so great in this gem of a city! Earthquakes in 1613 and 1693 left their mark, the latter killing 2400 people. The floods of 1833 and 1902 also left their mark – 5.5 metres above ground! Next time I go, I’d like to see the Cava d’Ispica (a series of limestone grottoes containing cave dwellings) and prehistoric and early Christian tombs. I missed out on my cemetery fix this time round. One thing for sure though, I’ll be booking back into the Palazzo Failla. 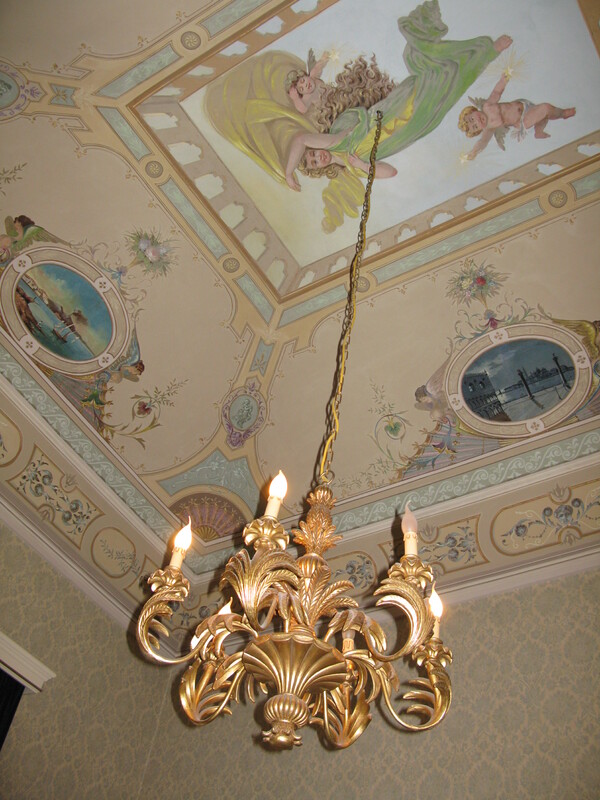 Had I been born into eighteenth-century Sicily, I’d have lived here. It’s beautiful and the service is second to none. I could get used to that sort of treatment. When I was seven, my twenty-year-old cousin was old, which made my forty-year-old aunt very old and my grandmother positively ancient. Age was relative – relative to me. If I were to apply this same logic today, I’d have just passed the ‘very old’ mark and would be making slow but steady progress towards antiquity. I have an inbuilt ‘carbon-dating’ mechanism when it comes to putting an age on something, or someone. It doesn’t work very well; I’m rarely right. But that doesn’t stop me from attempting to date stamp people, places, and things. I grew up with expressions that lent credence and respect to the aging process and helped somehow to give register to age: as old as Methuselah, as old as the hills, as old as humanity. The fact that I didn’t know who Methuselah was, or which hills, or when humanity actually began was irrelevant. These expressions gave voice to the sentiment that age could be referenced; it could be put into context without having to know the exact ‘when’. The concept of age fascinates me, not so much as a labelling device but more as a testimony to endurance. In today’s throw-away society, there’s something very comforting in knowing that some things have been around…well, forever. They have a fixed place in our collective memory, and indeed in the memories of all those who have gone before us. On my register, Hinduism is the oldest religion; Damascus is the oldest city; and wrestling is the oldest sport. Ireland has the oldest known fields in the world (the céide fields which come complete with original stone walls); Hungary has the second oldest metro system; and Oxford, the third oldest university. It wasn’t until I moved to the USA that I fully appreciated the newness of old. I lived in Longview, Washington, a city the same age as Northern Ireland. The idea of someone planning and building a city as recently as 1921 surprised me. I visited a plantation house in South Carolina with furniture roped off to preserve it because it was so old; that same furniture would have looked at home in my grandmother’s sitting room. Words like ‘vintage’ and ‘antique’ hold a certain appeal for me. The Hungarian word antikvárium trips off the tongue with the same sprightliness as the English word antiquarian, despite there being a world of difference between second-hand and antique. I’m used to old. I like old. And some days, I feel old. And yet, despite my penchant for all things aged, my first visit to the megalithic Mnajdra temples in Malta left me strangely unmoved. It was perhaps their crudity: post and lintel construction with large slabs of limestone? Yep, about as interesting as a pile of rocks in a field. 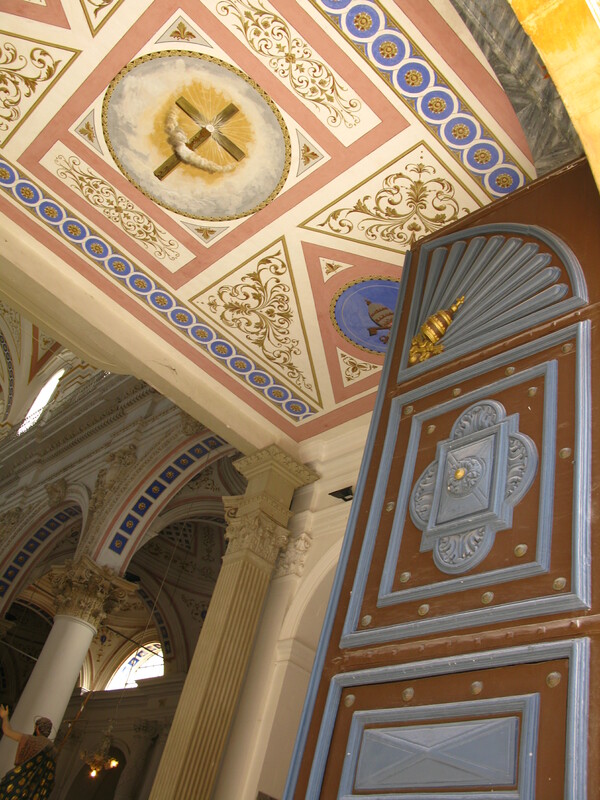 Ditto with Ħaġar Qim. I learned something new about myself. ‘Old’ has to go hand in hand with ‘interesting’ – age for age’s sake just doesn’t cut it anymore. 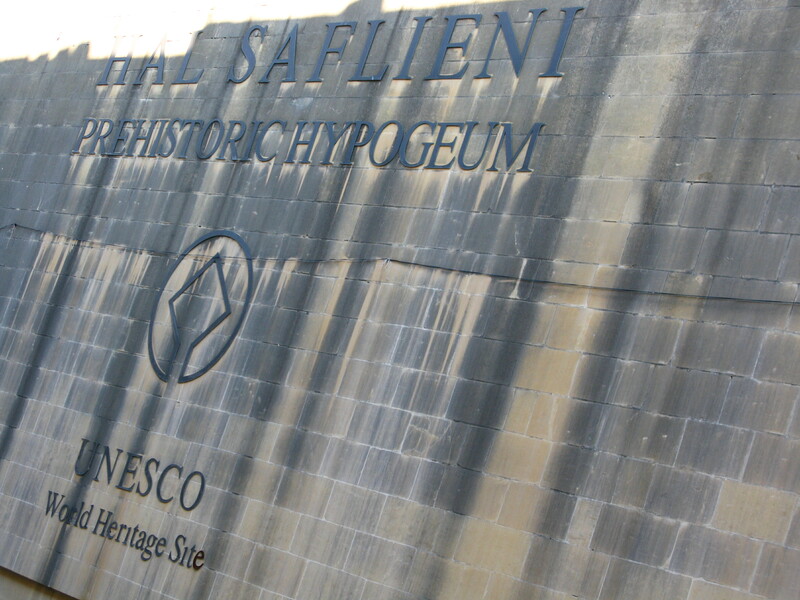 So when a friend suggested visiting the hypogeum at Ħal-Saflieni, I wasn’t exactly chomping at the bit. Malta and her ruins just weren’t registering! The hypogeum is an underground temple consisting of three floors with a series of interconnecting chambers, the most stunning of which is the ‘Holy of Holies’, a beautifully carved replica of a temple facade. Hewn from rock using stone hammers, chisels, flint blades, and antler picks nearly 5000 years ago, it is a true testament to patience and perserverance. 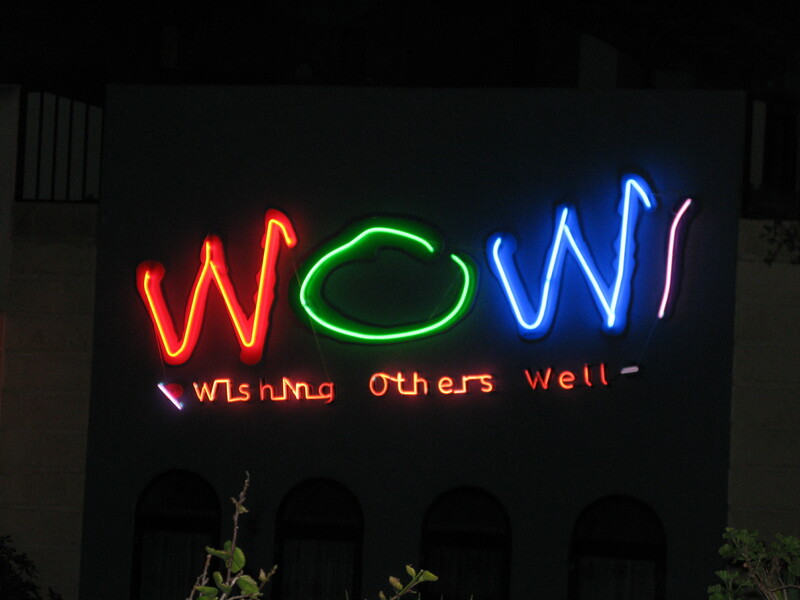 It personifies the best of both words – old and interesting. When it was first discovered, back in 1902, the remains of over 7000 people were found deep in its chambers. But even more amazing still, it’s in the middle of the town of Paola, down a side street, beneath a row of houses! When I walk, I tend to look up, at gargoyles, at rooftops, at church steeples. But since my visit to the hypogeum, I’ve been thinking a little more about what I might be walking over. Little did I know that all those times I walked across the Charles Bridge in Prague I was actually walking on eggshells. Or that while strolling along Via Appia in Rome, a parallel world of catacombs snaked beneath my feet. Strolling through the old city of Mdina last week I was surprised to hear that there is an old Roman city lying underground. It’s made me look at Budapest in a new light. So much of what I see in this city is above ground: spectacular buildings, contemporary graffiti, myriad statues. But what lies beneath? Underground? Is there a depth to this city, as is so often found in her people, that remains largely unexplored? 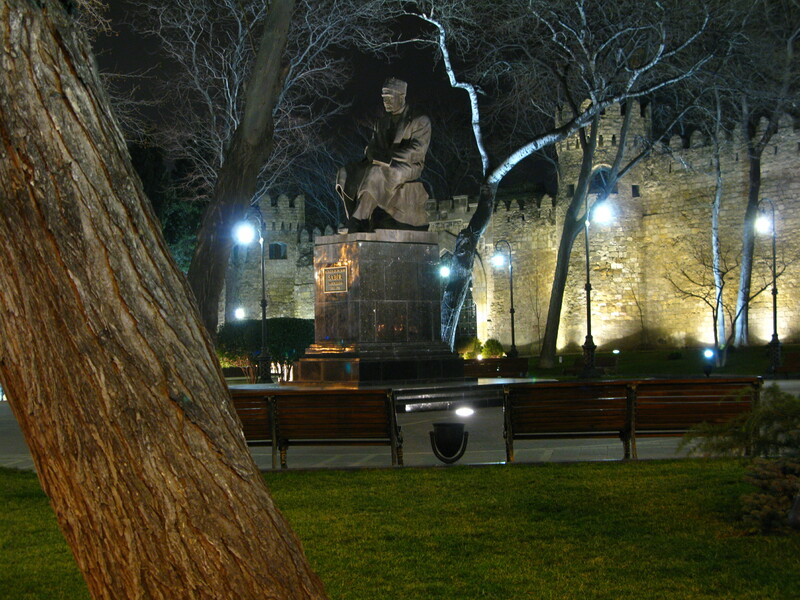 Baku at night is a city bathed in light. No matter than many residents have their electricity cut off at some stage during the day or night, there is plenty available to light up the museums and buildings in the city centre. 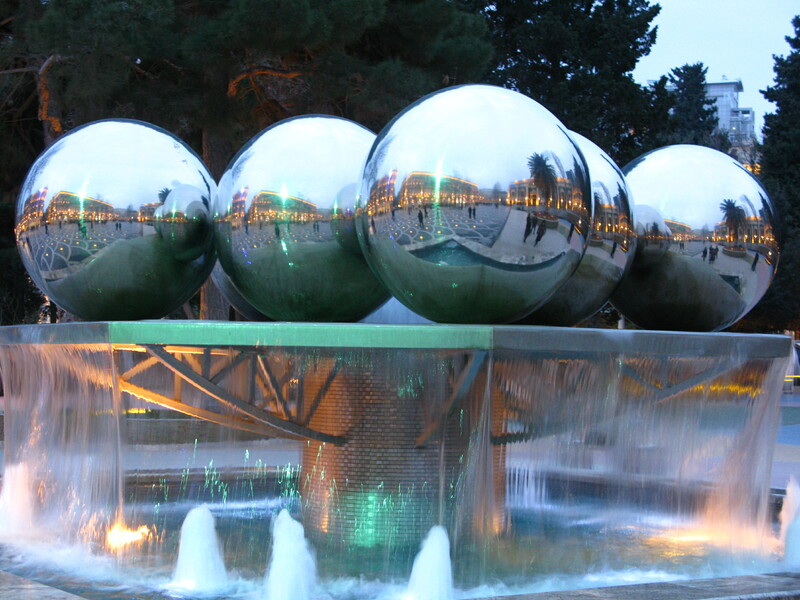 It’s also a city of water – fountains everywhere. And again, how do you marry this apparent plenty with stories of locals having to do without for days on end. Baku is indeed a city of contrasts. Practically every man I’ve seen (and I’ve seen lots of them) smokes. And yet it is frowned upon for a woman to smoke in public. I know when I lit up my first night here, it drew some strange looks from the waiters and yet Mr S quite happily puffed away without a bother. I’d ordered a beer, to see what the local brew was like, and again, this, too, is something women tend not to do in public. It’s not that it’s forbidden – little is – it’s more that it’s frowned upon. Leaving a shop one night, I made to walk on the pavement. It was under construction, as most of the city is. Instead of pointing me towards the road, this chap literally shooed me away – like my granny would shoo the hens from the kitchen in the summer. The look he gave me spoke volumes and a rough translation was probably somewhere along the lines of ‘stupid woman’. It rankled. But at least he saw me! 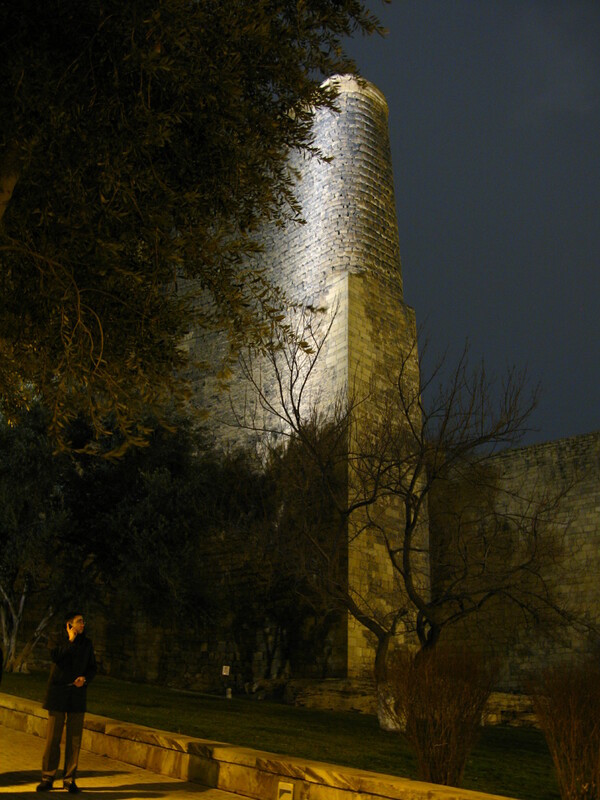 On the edge of the old town sits the Qiz Qalasi, Maiden Tower, which has become the symbol of Baku. It is to Baku what the Eifel Tower is to Paris or the Charles Bridge is to Prague. It’s beautifully situated looking out over the Caspian Sea. Apparently built in two phases in the 6th and 12th centuries, it’s an odd-shaped tower standing about 28 metres high. 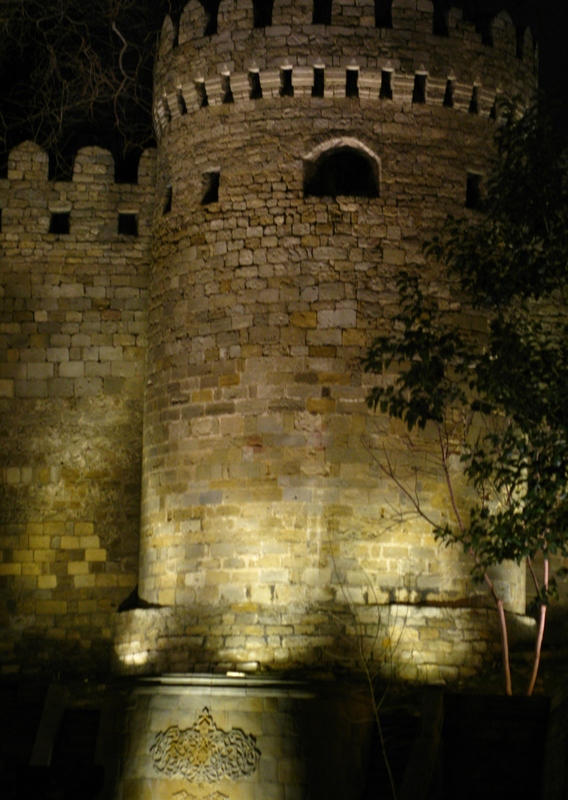 It has a solid stone flange attached to the eastern face of the tower, the function of which is not quite clear. Not much is known about it and legends abound. One legend has it that a maiden threw herself from the top when her father (the Khan of Baku) wouldn’t let her marry the man she loved. Another story tells of a man who fell in love with his own daughter. She was so horrified at the incestuous prospect that she put a halt to his gallop by asking him to build her a tower. Once he’d done so, she threw herself off it. There’s a stone at the bottom – the virgin’s stone – where brides-to-be sometimes lay flowers on the morning of their wedding day. A less interesting translation of Qiz Qalasi is ‘virgin tower’ referring to its military impenetrability. Taking the bus out to the Binә market, I was again reminded of the vast divide between rich and poor. Settlements dotted the roads – rocks weighing down the tin roofs on breezeblock houses. We were in Lada country now – with few fancy cars to be seen; just Lada after Lada after Lada. (And no wonder – gas/petrol is a mere €0.55!) I’ve become quite fond of these nifty little cars and take a ridiculous amount of pleasure when I see one winning a territory fight with an SUV. Were I to live in Baku and fancied taking my life in my hands every time I got behind the wheel, I’d go for dark green or mulberry and spend my Saturday afternoons washing it and then polishing it to within an inch of its life. The market itself is massive – acres and acres of warehouse full to the brim of some of the naffest stuff I’ve ever seen. The clothes come in two sizes – small and XXL. You can buy everything from a sink plug to an ankle-length fur coat. One-stop-shopping at its most extreme. BKV could take a lesson or two from the public transport authority in Baku. You cannot buy single tickets or daily or weekly passes for the metro (which looks like a replica of what we have in Budapest). Instead, you buy a prepaid card that you can top up. Each journey is just €0.15 which is deducted from your balance every time you swipe your card. On the buses, you can’t buy a ticket or a pass of any sort. Instead, as you leave, you pay the driver – again, it’s about €0.18 per journey. Same price no matter where you go inside the city limits. And although the doors open and close regularly and it might appear easy to slip away without paying, no-one does. Everyone pays. How novel is that Budapest?